Faustina Cartia is an Imperial spellsword and the leader of the Sirens, an all-female gang of thieves operating in Anvil. They operate out of nearby Gweden Farm. Along with Signy Home-Wrecker and Tsarrina, they prey on the married men of the town, using their feminine wiles to rob them of their possessions, right down to the clothes off their backs. She wields the unique one-handed blade Witsplinter that drains intelligence and damages magicka on strike. She wears upper-class clothing, a red velvet garment with a matching blouse and gold trimmed shoes. She carries the key to the Gweden Farm basement and a large amount of gold. She knows a set of spellsword spells as well as an extra Illusion spell and an expert level bound sword spell. After you have spent a brief moment at The Flowing Bowl, Faustina and Signy Home-Wrecker will enter. If you are a male character, Faustina will say: "Signy wants to talk to you. I think you’ll like what she has to say." After Signy has invited you to the farm, Faustina will say: "Can’t wait to see you later. Don’t keep us waiting." If you ask her about the ‘night of fun’ she will flirtatiously respond: "Hope you’re not planning to get much sleep." When you arrive at the cottage, Faustina will approach you with the words: "I see you took us up on our offer. Good. I’m glad to see you. Signy will be along shortly. I’m sure we can find something to do while we wait. Now we can’t have you standing there all uncomfortable in all those clothes. Why don’t you take everything off and place it there on the table." When you decline this proposition, she will say: "What? What are you talking about? Don’t you want to have fun? Come on, don’t be shy. Or are you here for something else?" When you tell her that you are there for Gogan’s ring, she will be furious and summon the other gang members: "Damn, I knew it. You’re working for the city guard, aren’t you? I didn’t think they would be stupid enough to send someone alone, but so be it. I should have known after I fenced that stupid ring and discovered it was a fake. Worthless! All part of the guard’s plan I suppose. Ok, girls! We got someone who doesn’t want to cooperate!" 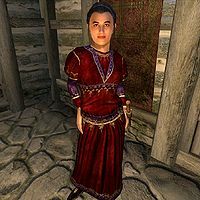 If you are a female character, Faustina will make you a different offer: "Never seen you here before. You look like you can handle yourself in a fight. And I’m sure you wouldn’t mind making a little extra money. Hmmmm... I’ve put together a, well... a gang. We make money by luring fools out to the middle of nowhere and robbing them blind. Our targets? Weak willed men who are easily fooled into believing they will have their way with us. Hahaha... men are so gullible. I leave the decision up to you. If you want to join up, meet us at the Gweden farmhouse around 11 in the evening. I’ll mark it on your map. Oh, and one more thing, if you breathe a word of this to the city guard, you won’t live long enough to get whatever reward they’re offering." When asked about the gang, she will say: "Just to be perfectly clear, we’re not prostitutes. We do everything on our own terms, and the men never, ever lay one hand on us." When you arrive at Gweden Farm she will welcome you: "I see you decided to take us up on our offer. Good. We could use another gal in the gang. Here’s how it works. We case the Flowing Bowl for a likely subject. Namely, we look for a married guy who drinks a lot. Then we’ll send you in there where you charm the man and get him to come out to some location we pick to rob him. When he gets there, we make him take off all his clothes, which is very easy by the way. When they’re helpless, that’s when we spring the trap. So far, we haven’t had to draw one drop of blood. The best part of the whole thing is that the men are so embarrassed, they won’t tell the guards! So, the bottom line is, you show a little skin... just a tease. No one touches you. What do you say?" If you suggest that ‘no’ is the answer, she will say: "Well, that’s never happened before. I suppose we’d have to kill you. I mean, we can’t have you going back to Anvil and ruining the whole plan. But why say no, when it’s so much easier, and more lucrative, to say yes? Or are you here for something else?" When you tell her you want Gogan’s ring, she will be furious and call for assistance: "Damn, I knew it. You’re working for the city guard, aren’t you? I didn’t think they would be stupid enough to send someone alone, but so be it. I should have known after I fenced that stupid ring and discovered it was a fake. Worthless! All part of the guard’s plan I suppose. Ok, girls! We got someone who doesn’t want to cooperate!" Esta página foi modificada pela última vez à(s) 21h53min de 18 de janeiro de 2013.